Irvine, CA, March 24, 2015. 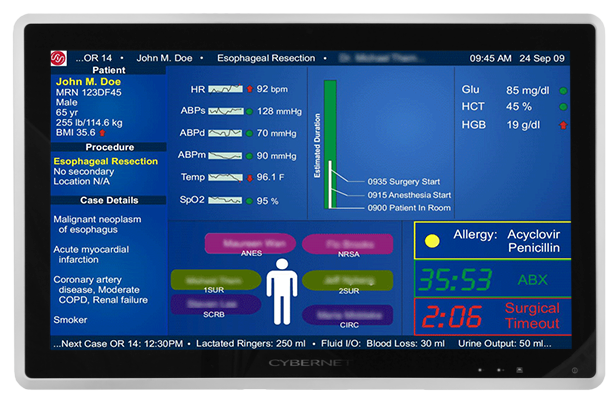 Cybernet Manufacturing, a market leader in high-performance PC technology, is proud to announce the addition of CyberMed CN22 all-in-one computing system to its lineup of fanless medical computers. The introduction of the new fanless variant strengthens Cybernet’s commitment to developing a broad spectrum of next-generation sterile computing solutions for the healthcare industry. Designed to work without the run-of-the-mill active cooling mechanism, Cybernet’s fanless medical computer lineup uses an innovative passive cooling system to keep the internal electronics, particularly the central processing unit, well within the operational temperature range – all without compromising on the ambient sterility. The CyberMed CN22 and HN24 fanless medical computers are most suitable for deployment in medical settings where preempting the spread of contagious ailments is utterly important. This includes intensive care units, operation theatres, labor rooms, diagnostic laboratories and other critical-care medical spaces. Doing away with the traditional fan-based cooling mechanism not only eliminates the spread of infectious diseases but also enables the end product to maintain a sleek, ergonomic profile and have a large multi-touch display. The fanless design also results in reduced auditory noise levels ensuring a serene ambience for the patient. The peculiar hum associated with typical fan-based computers is eliminated. Removing the fan-powered active cooling system leads to a significant reduction in electronic noise levels in surrounding healthcare equipment as well. In addition, advanced features such as anti-microbial coating, a water-proof front bezel, dust-resistant housing, conformity with global healthcare medical equipment standards, and Intel 4th-generation processors mark the Cybernet’s fanless computing solutions distinct. Cybernet Manufacturing is a global manufacturer of space saving, all-in-one PCs serving vertical markets such as business, banking, health care, and education. Cybernet is privately held and is headquartered in Irvine, CA, with operations in Taiwan, China, and Europe. The company employs 400+ employees worldwide. To learn more, please visit us as www.cybernet.us.